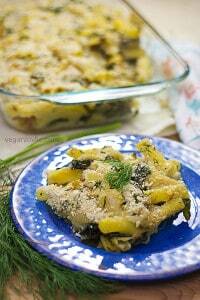 A delicious family-friendly gluten-free rigatoni pasta bake recipe in a creamy dairy-free nut-free bechamel or white sauce with green chard and cauliflower. 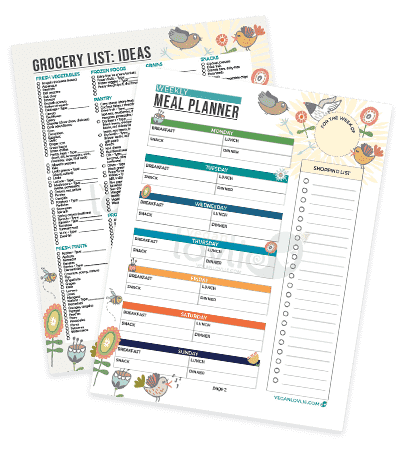 Whether it is a childhood favourite or the satisfaction of a hearty dinner, cooking a meal that you are also passionate about will set you up for an agreeable hour in the kitchen. The use of minimally processed ingredients makes this wholesome gluten-free rigatoni pasta dish certainly one to keep in your repertoire of quick dinner recipes that can be made under one hour. 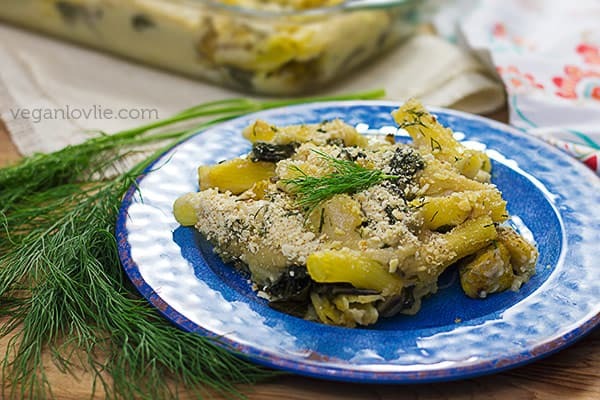 With a creamy cheesy white sauce, this baked pasta is the perfect recipe to tuck some greens onto your plate if you are among those who cannot stuff their face with plain straight up greens. Five stars or rather 10/10 was Kevin’s rating for this splendid meal. Come dinner time as we enjoy our meal, we have somewhat of a cute ritual between ourselves to rate each other’s concoction and discuss the taste, ingredients or what could be tweaked or improved. Food, if you haven’t guessed it yet, is a major conversation subject at the Lovlie Cocoon. 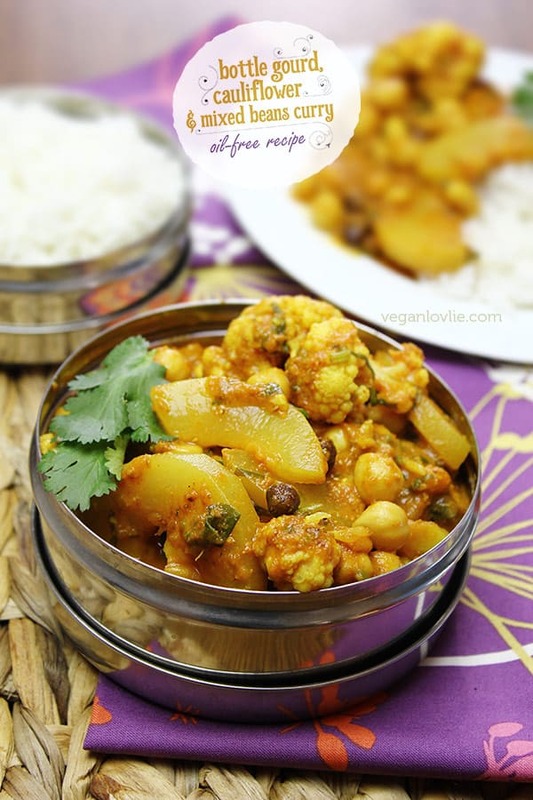 Over the years of blogging about vegan food, as I am constantly crafting new recipes and experimenting with untried ingredients or combinations, dishes are seldom repeated exactly. 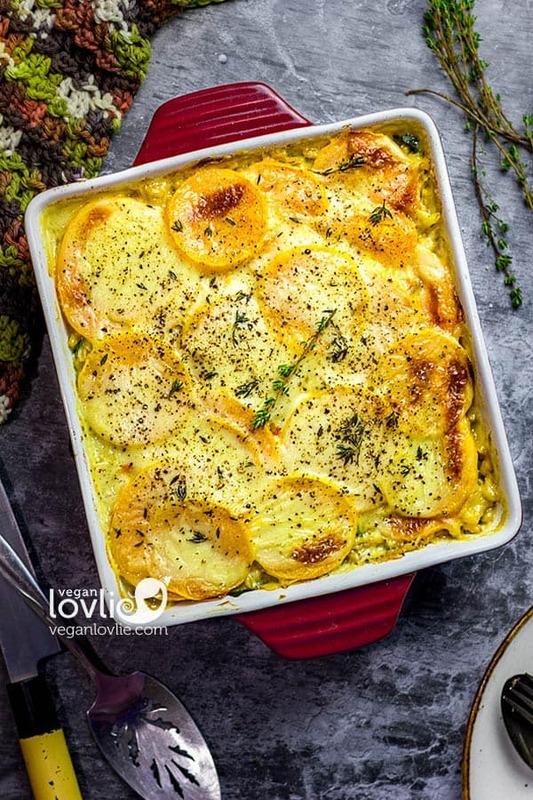 While the base bechamel sauce in this dish is one that I only tend to tweak slightly every now and then, when it comes to what goes into the pasta bake, the sky is the limit. Cauliflower adds in some juicy texture while green chard rounds everything off with some fresh vegetal notes. It’s very easy to overlook the array of greens at our disposal and get stuck on the kale or spinach train all the time, so this recipe calls for the chard family of greens which, though mildly bitter, are altogether pretty tasty. With not much disparity in taste, Swiss/rainbow chard or beet greens make good substitutes, although be wary that beet greens may stain the white sauce with a reddish hue. If you want to skip the baking, served just with the white sauce and topped with some grated vegan cheese if you happen to have any, this rigatoni pasta with green chard and cauliflower dish is sure to be a crowd-pleaser. Nevertheless, made in under an hour with oven time included, 20 minutes in the oven will magically meld and mingle the flavours of each ingredient while adding just enough of a crusty golden layer to contrast with the gooey interior. The final dish is so moreish even the oven will be asking for more! Pasta bakes make ideal leftovers that can be reheated in the oven or microwave with a little water. They can even be portioned into small baking dishes and kept frozen. When I used to work in an office, I would often bake a portion separately in these microwave/oven-proof glass containers that come with a handy snap-lock lid. This gratifying pasta dish needs nothing more than a simple green salad to round it out; it is certainly one to keep and make over and over again. Watch the recipe video for the step-by-step tutorial. Start by bringing a large pot of water to a boil. Meanwhile, prep the vegetables. Cut the cauliflower into florets and cut the green chard into ribbons. Finely chop the dill and set aside. Once water has reached full boil, drop the pasta in. Boil until the pasta is almost cooked or follow the package instructions and reduce the time indicated. While pasta is boiling, lightly cook the vegetables. In a skillet on medium-high temperature, add 1/2 tablespoon of coconut oil. Add the cauliflower and cook covered for about 5 minutes while stirring occasionally. Add in the green chard and cover. Let the chard wilt for a few minutes then stir. Set the vegetables aside. By now the pasta should be almost cooked. We want the pasta to be cooked only up to 75% as it will cook further while baking. So drain the water and set the pasta aside. In a pan, heat 1 tablespoon of coconut oil on medium temperature. Add the flour and whisk to mix it thoroughly with the oil (a silicon whisk is very useful in this case). Make a roux by roasting the flour into the oil for about 3 to 4 minutes until the flour lightly changes colour to a golden beige. Now lower the heat to a medium-low, and start adding in the coconut milk a little bit at a time while continuously stirring. If lumps start to form, turn the heat to even lower and continue to stir more vigorously while adding a little bit more of the coconut milk. Soon, the lumps should melt away leaving a creamy thick mixture. Next add in the oat milk and continue to stir. Add water if required if the mixture is too thick. At this point you may turn off the heat or turn it to very low while adding the flavour ingredients into the sauce. So, add in the nutritional yeast, miso paste, chili flakes, Marmite, thyme leaves and salt to taste. The sauce is what will flavour the whole dish, so make it a little bit saltier than what you would normally have. When mixed with the pasta and veggies, it will be just right. Turn the heat back to medium and simmer while stirring for a few more minutes until the sauce is neither too runny nor too thick. Preheat the oven at 180 degrees Celsius or 350 degrees Fahrenheit. 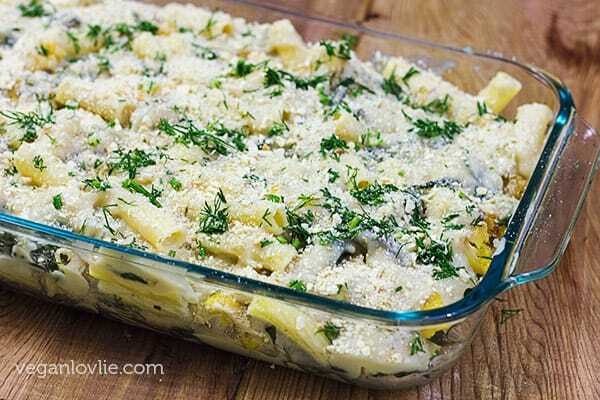 You can mix the pre-cooked vegetables with the pasta or leave them separate and layer them into the baking dish. Once mixed, fill a rectangular baking dish with half of the pasta and veggie mixture. Layer with half of the white sauce. Mix the sauce lightly with the pasta so that it seeps in between. Sprinkle with some of the chopped dill. Place another layer of pasta and vegetables followed by a top layer of the rest of the white sauce. Sprinkle with breadcrumbs. I have used some crushed crackers instead of breadcrumbs. Use gluten-free breadcrumbs/crackers if needed. Sprinkle with some more dill. Place in the oven and bake for 15 to 20 minutes until a nice golden crust is formed on top. Remove from the oven and allow to cool for about 5 minutes before serving. 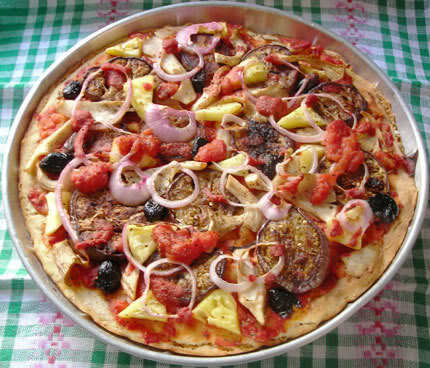 Accompany with a green salad and enjoy! I made this with broccoli, cauliflower and spinach and it turned out so good, I had to make it again that week. A winner in my book, I added garlic to the vegetables and sauce, I put garlic in most of my recipes. Topped it with salt and pepper, garlic and onion powder before baking it. Thank you for sharing this recipe! This recipe is superb! Love the sauce and I’ve made it with different pasta too. Thank you.